I’ll help you up your branding and website game with my signature services. I love working with entrepreneurs and solopreneurs who are ready to improve their online and brand presence to attract their ideal clients. Let me help you rock your online presence with a stellar website. Your website is the framework for your business: the alpha and omega of who you are and what you do. 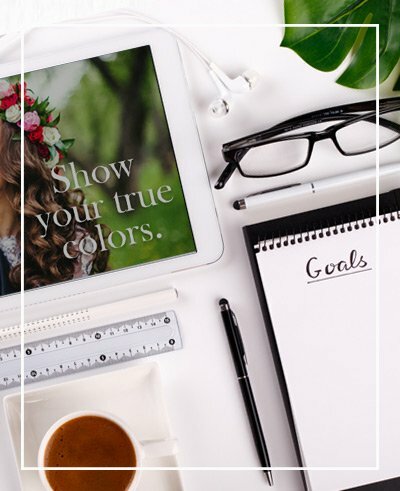 Your new site will assist you in attracting and connecting your online and social media efforts with your dream clients. In addition, your site will be built using WordPress, the leading content management system and will be easy to update and maintain. Ready to create your online presence? Want your brand to stand out? Let’s start at the beginning and talk about your vision, your customers, and your needs. We’ll figure out what makes you unique and how to convey that unique message with visual branding. We’ll discover the colors, content, messaging, design, and identity to attract the clients you want. My process is super fun and easy! Ready to get your brand started? Other packages and options available. Just getting started? Need a total brand and website revamp? We’ll take a comprehensive look at your branding, design and content efforts. You’ll finish with a brand new brand and website that truly reflects you and your business! Complete branding, website design and development packages start at $2650. Sometimes you need a fresh perspective and solid advice to jump start your marketing efforts or take them to a new level. My brand review sessions will help you nail down the messaging and visual direction to best communicate your brand. If you are a Do-It-Yourself type or just need a trusted friend to help you brainstorm, you’ll love my Strategy Sessions. These one-on-one phone coaching sessions, along with practical take-away assignments, will help you focus and achieve optimal results.